France (French: [fʁɑ̃s]), officially the French Republic (République française [ʁepyblik fʁɑ̃sɛz]), is a country with territory in western Europe and several overseas regions and territories. 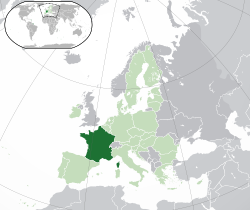 The European, or metropolitan, area of France extends from the Mediterranean Sea to the English Channel and the North Sea, and from the Rhine to the Atlantic Ocean. Overseas France include French Guiana on the South American continent and several island territories in the Atlantic, Pacific and Indian oceans. France spans 643,801 square kilometres (248,573 sq mi) and had a total population of almost 67 million people as of January 2017. It is a unitary semi-presidential republic with the capital in Paris, the country's largest city and main cultural and commercial centre. Other major urban centres include Marseille, Lyon, Lille, Nice, Toulouse and Bordeaux.